Qualcomm’s new Snapdragon 850 follows on from the Snapdragon 835 almost a year after. The Snapdragon 850 is built from the silicon as the Snapdragon 845, and uses the benefits that the flagship mobile chip introduces for this generation. This time around however, rather than calling it the Snapdragon 845, similar to the chip inside popular smartphone flagships such as the Samsung Galaxy S9/S9+, LG G7, HTC U12+, and OnePlus 6, Qualcomm is differentiating it by upping the number. 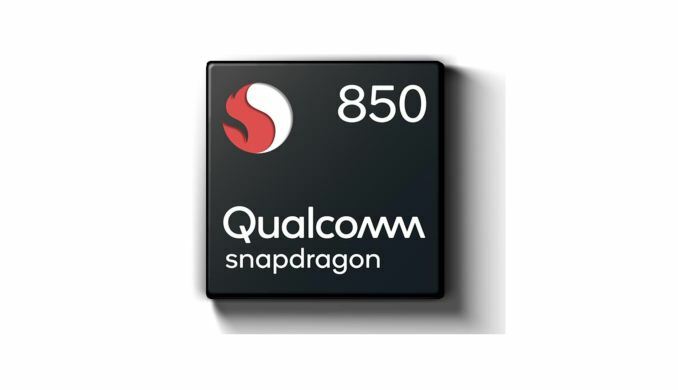 The Snapdragon 850 uses the same silicon floorplan as the Snapdragon 845, however the frequencies and firmware are tweaked for extra performance. Compared to the S845, the S850 has additional CPU frequency in play, with the Kryo Gold 385 cores having a 2.95 GHz turbo frequency rather than 2.80 GHz. The bigger differences occur comparing the S850 to the S835 platform. Aside from the microarchitectural updates (Kryo 280 to Kryo 385, Adreno 500 to Adreno 630), the Snapdragon X20 modem can now reach speeds of 1.2 Gbps, and Qualcomm is going to leverage the AI capabilities of their Hexagon DSP a lot more with the new platform. The new platform, according to Qualcomm, should afford an additional +30% performance, +20% battery life, and +20% wireless speeds. Playing to the platforms strengths, the battery life claim is one of Qualcomm’s key messages. Specifically, they state that the platform can now move from ‘all-day’ battery life to ‘multi-day’ battery life, and depending on the specifics of the platform, should allow users to go from day-to-day without charging, even with modem use. 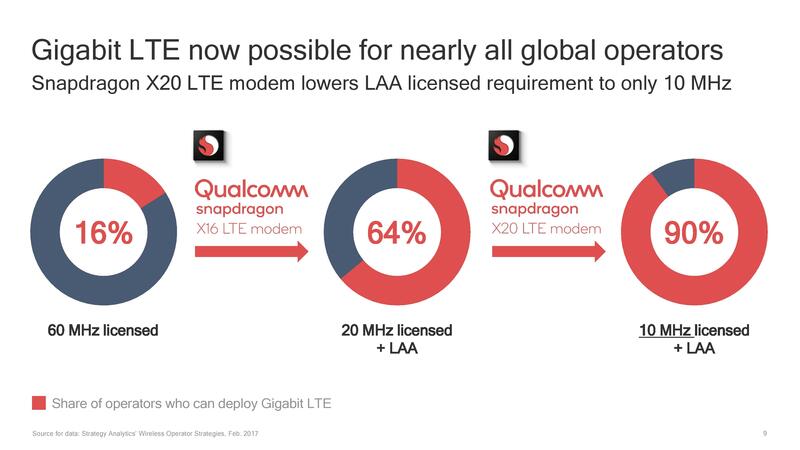 On the modem, the Snapdragon X20 LTE modem now supports licenced 10 MHz spectrum with LAA, which Qualcomm states should allow for Gigabit connectivity speeds in 90% of the worldwide LTE markets when combined with carrier aggregation technology. The S850 also uses the upgraded audio and video codec features we saw in the S845. This includes support for H.264 and HEVC 4K encode and decode for video playback services, and support for extended 4K video capture from integrated cameras. On audio Qualcomm is stating improved dynamic range and reduced harmonic distortion metrics on its audio codec, but no exact numbers were given. Both analog and digital audio output is supported with Qualcomm’s Aqstic and aptX technologies. 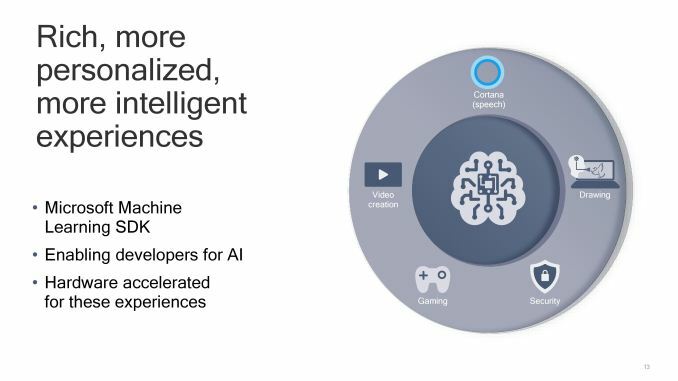 For this next release, Qualcomm is keen to talk about how AI is being implemented with Snapdragon 850, along with the availability of natively compiled code without having to rely in the instruction translation layer. With the latest Windows April 2018 update, the Snapdragon based systems will be compatible with Windows machine libraries compiled for Arm based processors. 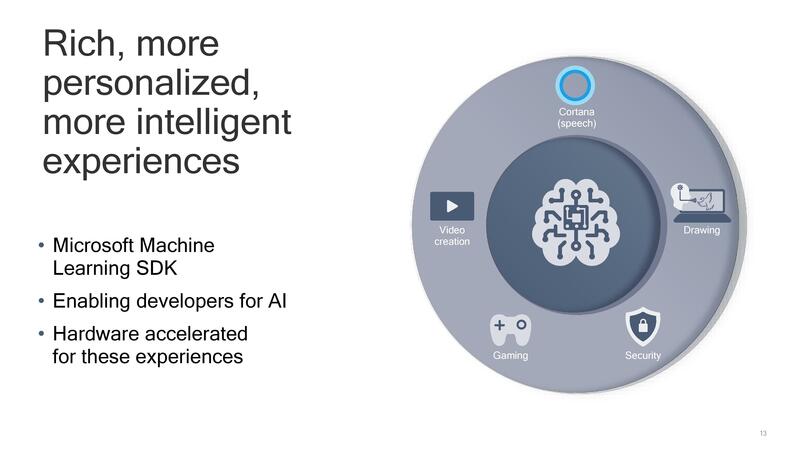 At present, Cortana is accelerated using the Hexagon DSP, and other assistants are in the works to also be hardware accelerated. Microsoft Edge will also be re-optimized for the platform. Qualcomm stated that they have been working further with Microsoft to bring RS4 to the next generation of ACPC devices, fixing a number of initial software compatibility issues that arose from the initial launch, allowing more programs to run as intended. Qualcomm has implemented a 64-bit SDK for developers looking to optimize their code, with the general mantra being that it is better to focus on native 64-bit applications on ARM rather than emulate. 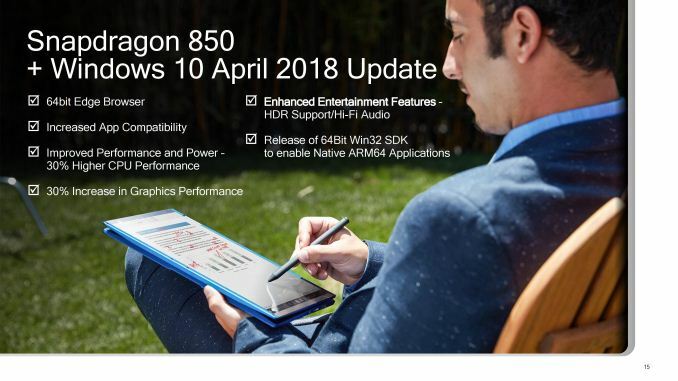 64-bit emulation is still a work in progress, however Qualcomm has noted that a fair amount of software is compiled in 64-bit mode even if the program cannot take advantage of it, so the company is hoping that the 64-bit SDK can alleviate some of those edge cases. One poignant part of 2018 has been security, and Qualcomm is stating that most of the Spectre and Meltdown issues are patched with the new platform. With new Smelt-style attacks coming through the pipe, they cannot legally say ‘all’ of the issues, but there is a team of engineers in play, as with all vendors, for what will be whack-a-mole for the foreseeable future. Qualcomm states that users will be patched as new problems arise as soon as is possible. 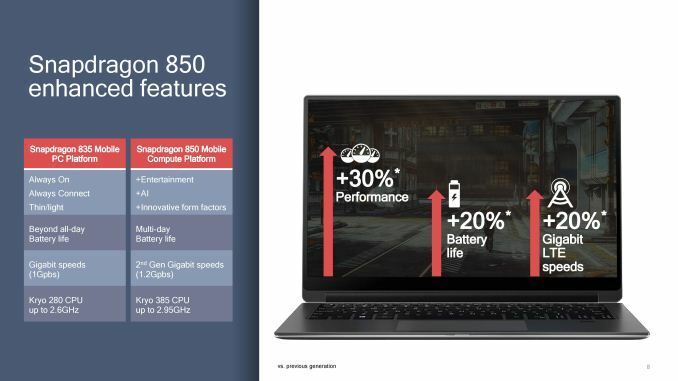 The focus of S850-based ACPCs, according to Qualcomm, is going to shift from traditionally PC-based companies to more mobile-focused companies. HP, Lenovo, and ASUS are all expected to implement refreshes or new designs, however we were told to expect the traditional mobile companies to get onboard. 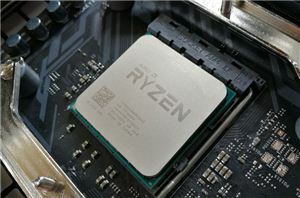 These companies are more used to a yearly cadence update cycle, which combines well with the research (as published by Intel and others) that new form factor users tend to update more frequently than traditional users. No particular companies were mentioned, however we could imagine companies like Samsung, LG, Xiaomi, and Huawei might be some of them. Each company will perform their own announcements in due course. One interesting discussion point to come out of this during our discussions with Qualcomm is one of expertise. 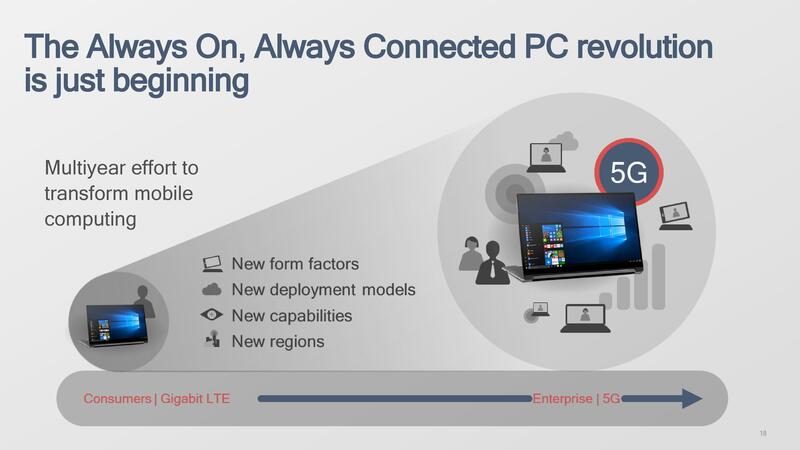 Traditional laptop makers might not have a refined skill set for designing laptop-style platforms with a focus on mobile platform-like characteristics, such as wireless carrier connectivity. It was reported in the first generation that ASUS, who has a history in smartphones and antenna placement, had a better carrier connectivity than the others, despite using the same hardware – this was down to antenna placement and chassis design. For the new platform, Qualcomm is offering more assistance to the OEMs and vendors when it comes to reference designs and components, with one example being a reference modem design and layout. 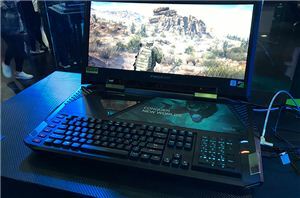 These laptop designs can, if they want, take a reference design module and implement it in their designs as-is, taking other benefits such as pre-approved carrier certification that can come along with the turn-key design. We were told, specifically with the case of the modem reference design at least, that some OEMs will be using it for the first wave of Snapdragon 850 designs, and there will be partnerships with carriers in specific regions in play for the new portfolio. 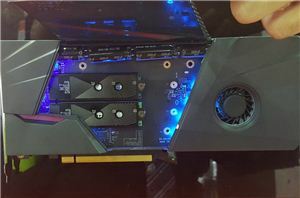 This announcement is during Computex 2018, and we might be seeing some devices using the new platform behind closed doors or actually being announced on stage. Qualcomm and its partners still have to fight the early first/second generation adoption pains that come with a re-imagined device category, however we will hopefully see a wider selection and a wider distribution this time around. For those waiting for 5G, the smart money is likely to wait for the Computex 2019 announcements next year. Well with a higher TDP ceiling (and better cooling) it can also sustain performance for longer than most phones with the same chip. The problem is price point.. They were selling them for 1k bc they want to market them as premium product, not cheap laptop so they can get a bigger margin. They market the long battery life as a reason for the premium price. For me and also as the sales show, battery life is not the only factor. Plus laptops are getting pretty good battery life with 8 hr or so. But when you get to the higher end price points like 700+, all of a sudden Intel chips becomes more at attractive as an alternative. I'm running a $200 Cherry Trail tablet as my ultralight travel machine and it's fine, although battery life isn't great at 7 hours. An SD850 machine could get equivalent performance for ARM apps and double the battery life.